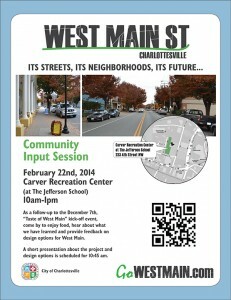 come by to enjoy food, hear about what we have learned and provide feedback on design options for West Main. The meeting will be held from 10 am to 1 pm with a short presentation about the project and design options at 10:45 am. This entry was posted in Latest News on January 24, 2014 by admin.